Jolene Nenibah Yazzie (Navajo), "Beautiful Shield" 2006. Digital print. Courtesy of the artist. Upstairs in the intimate Sealaska Gallery at the National Museum of the American Indian is a fascinating exhibition on the intersection between Native culture and a uniquely modern art form. “Comic Art Indigene,” now through May 31st, highlights over 35 artworks of various mediums from the earliest rock art and clay figurines through to classic comic strip panels. Containing images both humorous and provocative, it’s well worth a visit. 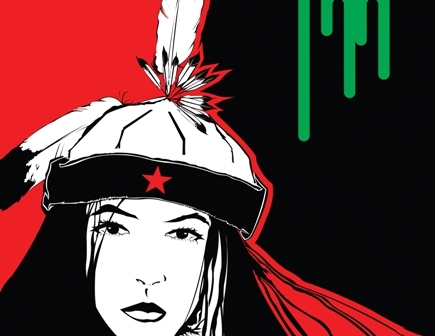 If you’re interested in the history of how traditional methods of storytelling evolved into using comic art as a means of Native expression, the beginning of the exhibit clearly outlines this process. I just urge you to make sure you move beyond that initial area to the back walls and pay careful attention to the incredible pieces by Diego Romero, Mateo Romero, Jolene Nenibah Yazzie, and Rose Bean Simpson. These artists collectively pack a powerful graphic suckerpunch. Jolene Nenibah Yazzie (Navajo) was a skater girl in high school, and her childhood inspiration was Wonder Woman. Both facets are evident in her supersaturated color contrast and strong female images. I loved “Beautiful Shield” – reminding me of a bit of Patrick Nagel (though these women could kick Nagel’s to the curb!). If I could own one piece of artwork from the show, this would be it. I spent a long time in front of Mateo Romero (Cochiti Pueblo)’s “Unpublished Horror Story” – done in comic strip style, it features a riveting anti-hero, drugged out and vomiting in a film noir city of nightmares. It’s stark and painful stuff. So I was a little shocked to later find out Romero is primarily a painter, with some beautiful dreamy images. It’s my hope that NMAI continues branching out into this kind of exhibit, highlighting modern Native culture in less of a traditional, anthropological way. It’s exciting to see people’s preconceived notions of Native art shattered.